NORWALK, Conn. — Norwalkers are reacting to the news that the New Haven Board of Education spent $150,000 on a legal settlement involving Frank Costanzo, now Norwalk Public Schools Chief of School Operations. The Norwalk Board of Education “first heard of the lawsuit when it was filed in 2017 (well after we had hired Mr. Costanzo in 2015),” BoE Chairman Mike Barbis wrote Friday, later releasing a statement lauding Costanzo’s performance for Norwalk Public Schools. Goldson declined to comment to NancyOnNorwalk. NHPS Chief Operating Officer William Clark did not immediately respond to a Monday afternoon email from NancyOnNorwalk, requesting the settlement documents. Costanzo was accused of sexually harassing a New Haven Public Schools employee while he was an administrator there. Costanzo came to work in Norwalk in September 2015; the incidents described in court papers are alleged to have happened in 2014. Plaintiff Chanel Renee Rice filed the suit in March 2017. Connecticut Association of School Administrators (CASA) Chairman Tony Ditrio has also blasted Costanzo, pointing out in multiple conversations with NancyOnNorwalk that Rice, in court documents, quotes Costanzo as saying he couldn’t remember what happened at a Christmas party because he had been inebriated. “I have not heard directly from any parents or community members about concerns regarding this settlement in New Haven although I am aware that there are social media postings about it. “There was no finding or admission of any improper activity in the case (this was a settlement with no admission of the allegations). “Of course, ‎this lawsuit had nothing to do with the Norwalk Board of Education and the settlement was exclusively with the New Haven BOE. We had nothing to do with it. The story was posted on the Facebook page Norwalk Parents for Education. “I’m not sure why this would be news to anyone. This has been known for years. Norwalk willingly and knowingly hired him knowing this lawsuit and the allegations surrounding him,” another wrote. 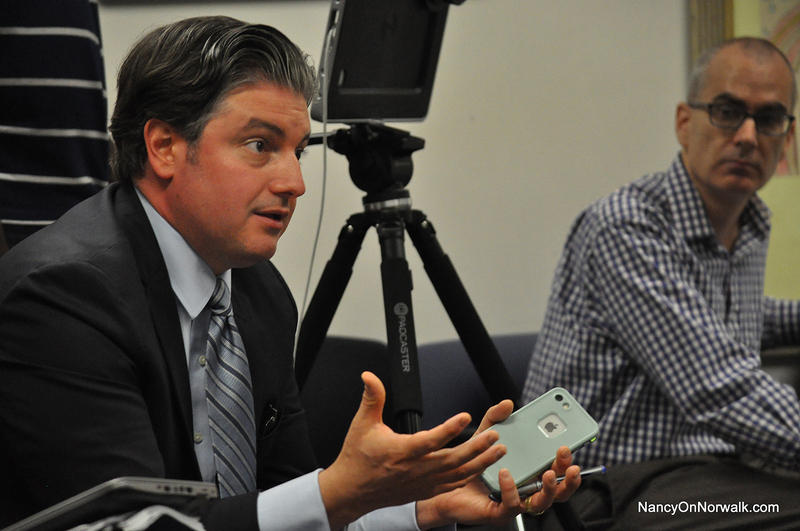 While Barbis said the Board of Education didn’t know about Costanzo’s New Haven problems when he was hired, Ditrio has said Norwalk Superintendent of Schools Steven Adamowski did. “Dr. Costanzo was not ‘desperate’ for another job. He was recruited by me along with several other outstanding administrators that I had worked with, knew about, or who were recommended by others I respected. I became aware of Frank’s work when I was special master of Windham. The Windham High School redesign was based in part on the widely known success of Cooperative Arts and Humanities High School in New Haven, where Frank was the principal. A delegation of Windham staff visited his school on several occasions, and Frank served as a consultant on the design specs for the new humanities academy in Windham. During that time, I became aware that Frank’s school had the highest graduation rate of any New Haven School (93%), and that New Haven Superintendent Garth Harries was also utilizing Frank to coach other principals. “While we will not comment on the allegations brought against Dr. Costanzo and the New Haven school district for their handling of allegations, we can comment on the process in Norwalk. “No one involved in the hiring process knew about Ms. Rice’s allegations regarding Frank Costanzo at the time he was hired in 2015. The only source presented is Tony Ditrio, a former employee who has made numerous unfounded allegations in the past. “Ms. Rice did not file her case until 2017. Dr. Costanzo’s record in Norwalk has been exemplary and there have been no allegations against him here. He has tackled many challenging situations across our district. Staff and parents have reached out to us in an impressive show of support for Dr. Costanzo. “Examples include his availability 24/7, his thoughtfulness, attention to detail, dedication, balanced approach, and his willingness to provide a tough message when needed. One administrator said to us, ‘He is a responsible administrator with the district’s well-being at heart’. “The Executive Committee of the Board of Education would note that Dr. Costanzo has given us much needed guidance in challenging situations where we have had to make difficult decisions balancing the needs of students, parents, teachers, administrators and other staff members. Ditrio retired in 2016 from his post as Kendall Elementary School Principal, a role he took in 1999. He is also former Norwalk Association of School Administrators (NASA) President, and carried on as Vice President after retiring. Board of Education member Julie Corbett on Facebook addressed the allegation that Costanzo has been “put in place” to be the next superintendent. BOE’s around the nation invariably deal with litigation from parents, staff, etc. It’ a major source of income to local/state attorneys specializing in State public school law. Question is does the public benfit from publicizing incomplete information on BOE litigation. Under the BOE leadership of high profile Corporate Attorney Mike Lyons our City’s BOE hired the State’s premier public school law firm. Those interested can compare the Lyon’s record with previous litigation over many years under different arrangements. It’s quite favorable. Our BOE remains Norwalk’s “Bright Spot”. Because I am an administrator in town, I typically do not comment on postings. However, I am strongly compelled to submit a response that will hopefully end the debate or concern about Dr. Frank Costanzo. I am neither interested nor concerned about his previous district. I am focused on the present and how contributions to our system thus far. Allow me to elucidate on my opening statement. My experiences have been one based on mutual respect. This is a man who will make himself available to me at any time of the day whenever I need advice concerning an operational or instructional issue. Despite his numerous responsibilities, he will visit schools and sit aside a student to ask how they are doing and participate in the learning. Afterwards, he will engage in a dialogue that is intended on improving student learning. Dr. Costanzo will have no issue providing hard messages when necessary. He does so because he is a responsible and capable administrator with the district’s well-being at heart. In addition, his feedback is essential to providing best practices for my students. Not only is he tough and fair, but he is compassionate. His support was on full display last year, when my school community experienced a gut-wrenching tragedy. He was the first person I contacted at 7:00AM, and he helped me process the event. His support was very evident as he spent numerous amounts of time in my building and helped coordinate a crisis team to serve my school community. In addition, he kept on checking up on me because he was sensitive to the fact that as I supported everyone, someone needed to look out for me. The stress I experienced was alleviated due to the steadfast support I received from Dr. Costanzo, the superintendent, and the staff at Central Office, not to mention my wonderful colleagues and their schools. Everyone has the right to their opinions, however, as I have taught my children, speak with facts, and provide evidence to support your claims. I am speaking from facts I have personally experienced, and I hope my claims resonate with anyone who may be concerned about the present and future. Those are the timelines I am most concerned about. In closing, I ask that readers will know that I write this testimonial, not because you might think I will personally benefit, but because I know what I am talking about. I submit my personal statement to all who might agree or disagree, with nothing but respect. Mr. Costanzo is an outstanding administrator. Not all settlements are based on guilt or innocence, many are based on economics. Stop with the witch hunts and focus on the future. If we are so concerned about Costanzo and his judgement should we be concerned that he brought in a former teacher from that very school where this took place to be an administrator at Kendall? Maybe he brought people that would back him if this came out. As a parent now this concerns me about what that administrator knew. Just so worried about our kids and who is in charge of them. Just want to know my kids are in a safe school system and this just worries me. First of all, whether or not Mr. Costanzo does a good job is irrelevant if he sexually harassed someone. Clearly you must realize that Mr. Thomas. It’s insulting to any victim of sexual assault to assume otherwise. Second, by his own account Mr. Costanzo can not recall the events because he was too drunk. Third, it sure would have been nice if someone from New Haven took it upon themselves to do Norwalk a solid and send an email using their work email warning Norwalk of this. And then Mr. Costanzo could sue New Haven for ruining his job in Norwalk and make money off of it. this seems to be a pattern in Norwalk. As the SPED chief had serious legal issues in New Rochelle school system she was previously employed, the feds got involved. And now this. I guess we cant get better. just the fact that there was an accusation is enough to rule him out. oh and he cannot recall cause he was too drunk… word? Isn’t Frank Costanzo the person to whom principals bring complaints of sexual harassment? If this is true, the Board is in serious trouble.